Growing up, I loved to hear my mom’s stories about her early career days saving the world while working as a photographic analyst for the CIA during the Cold War. A failed secretary, she made a great missile expert and researcher, even learning Russian. She would recount tales of sharing an apartment on P Street in Georgetown, referred to as “The P Street Mission,” where she and her roommates engaged in fierce bridge battles and ordered six packs of beer for delivery from the pharmacy across the street. When her first paychecks came in, she indulged in two items that I still have today: a mink stole in a shade called “Autumn Haze” and a richly-colored, Italian Nativity set. Every Christmas, I was given the honor of helping remove the finely detailed figures from a box of excelsior and tissue paper that had such a high cotton content, it was soft rather than crinkly. One of the Three Kings was styled as a Moor; Mary’s robes were a traditional soft blue and rose. My brother and I would sit at the foot of the tree playing “I Spy” with ornaments and the crèche figures. We would all hold our breath when something jostled the set and the Gloria angel fell off its tiny nail. Thankfully, it never broke. Over time, the colors mellowed, the faux moss on the stable roof deteriorated and, one by one, the lambs’ fragile legs gave way. No matter. By then, the crèche had worked its magic. I was hooked. During the height of my own career days, I became obsessed with the Angel Tree at the Metropolitan Museum in New York. In the Christmas season, I made lunch hour pilgrimages up from Midtown to see the 18th-century Neapolitan crèche. 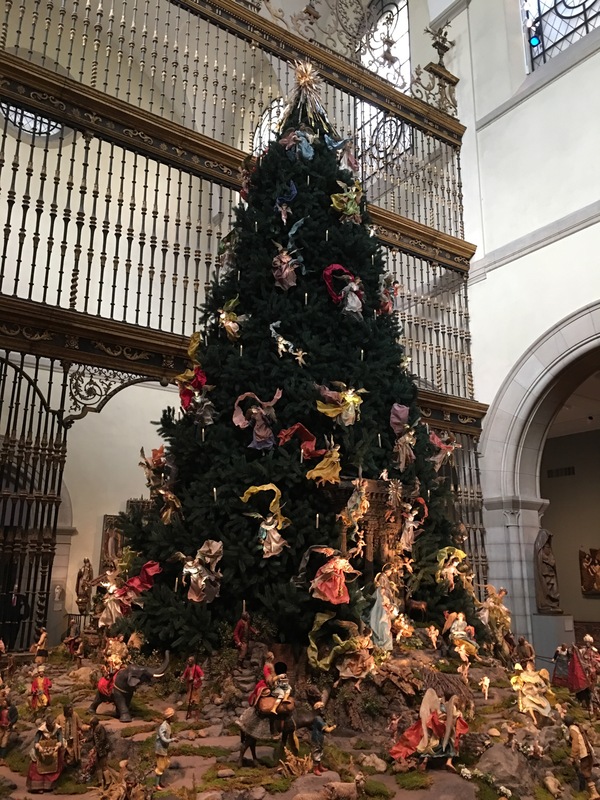 Originally from a private collector, the exhibit features exquisite silk-robed angels in a spruce tree hovering above an elaborate village scene sprawled out around the tree’s base. The display was meant to be ecumenical, uniting the Christmas tree tradition of Protestant origins with the Catholic tradition of the crèche. I know I am biased, but the village is my favorite part. Detail from the Angel Tree – townsfolk going about their business. That was where we would have lived. Photos don’t do it justice. Like Our Lord, you have to step back and take in the entire scene to fully appreciate the scope. No other sight better represents the meeting of heaven and earth we experience in the birth of Jesus. While the angels on the tree float above the Holy Family, all around, people are going about their daily business. Only a few are aware of the divine miracle occurring in their midst. While I have added many Christmas traditions to our home, none has ever had the effect of our Nativity set, which rules over the dining room. Inspired by my mother’s set and the Angel Tree, this ever-expanding recreation of Bethlehem attracts and engages us all. It is the first decoration we put out and the last to be packed away. Kids are instantly drawn to it and that is OK. Our Wisemen our not walking; they ride on exotic animals, including an elephant – and that elephant has been around. I might wake up one morning and find that a Lego figure, Mario or a Shopkins perfume bottle have joined the scene to honor the Savior’s birth. Figures have been paired off in new and exciting ways. The bread seller seems to have a particular attraction to the female grape merchant. Hmmm. As it should, the Gloria angel falls off its nail if you look at it sideways. We are making Jesus’ story into our story. It is crèche-tastic. As you might suspect, this is not the only set we have. There is an all-white nativity, a yard nativity, an olive wood nativity, several children’s nativity sets and, of course, my mom’s original set, which we rescued from her nursing home move in a mis-marked cardboard box that was falling apart. Following my mom’s practice, the infant Jesus does not appear in most of our sets until Christmas morning. Once that is done, it is officially Christmas. The crèche has truly brought us all together. I can kick back in my slippers amidst an explosion of wrapping paper with a glass of champagne (another family tradition), the Autumn Haze mink over my PJs. It is time to relax and enjoy the celebration of Christmastime. After all, helping to give birth to Our Lord is thirsty work. I LOVE this! As someone who collects Nativity sets, this really hits home. How special to have your mother’s set, and what wonderful memories it must give you. Merry Christmas! My home parish has a STUNNING Nativity scene – complete with painted, 3D, set, suspended angel, and lighting. It made a big impression on me as a kid. I looked forward to the First Sunday of Advent every year just to see that Nativity!